For every day that we spend in the US, we add another location to our list of places we want to visit. As such, it’s nice to every now and then actually tick something off the list. Earlier this month we were able to welcome my parents to the US for a short vacation. 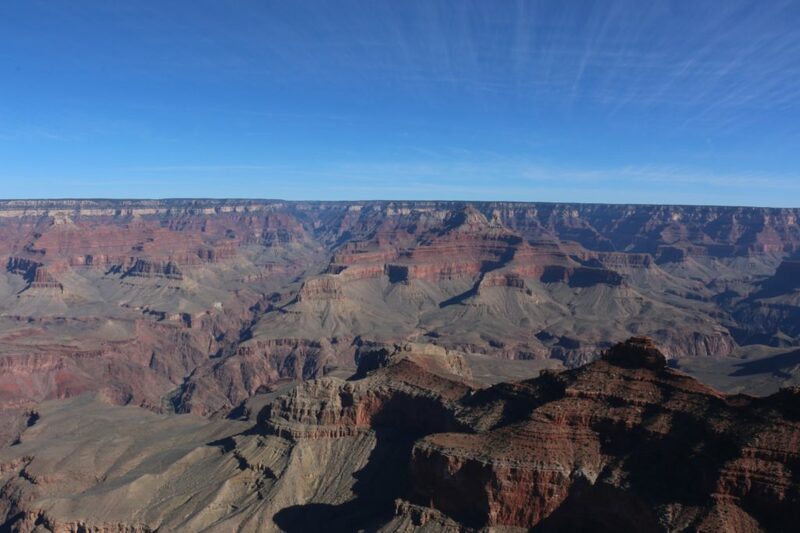 We used this as an excuse to do a trip out to the Grand Canyon, and see just a few of the many sights Arizona has to offer. The Grand Canyon is a well-known international destination, and for good reason. Growing up in South Africa I had the opportunity to visit Namibia, and hike through the Fish River Canyon. With majestic views and beautiful scenery, it’s a sight to behold. But as the saying going, everything’s bigger in America. We’ll skip around the confusing definition of what a canyon is, versus a gorge, or valley, or kloof, or poort, or the many other words with similar but different meanings, and just accept that the Grand Canyon is much larger than the Fish River Canyon, but by no means the largest in the world, or even the Americas. Stretching almost 540 km, the canyon reaches depths of almost 2 km, with rims as far apart as 30 km. It is truly grand to behold. 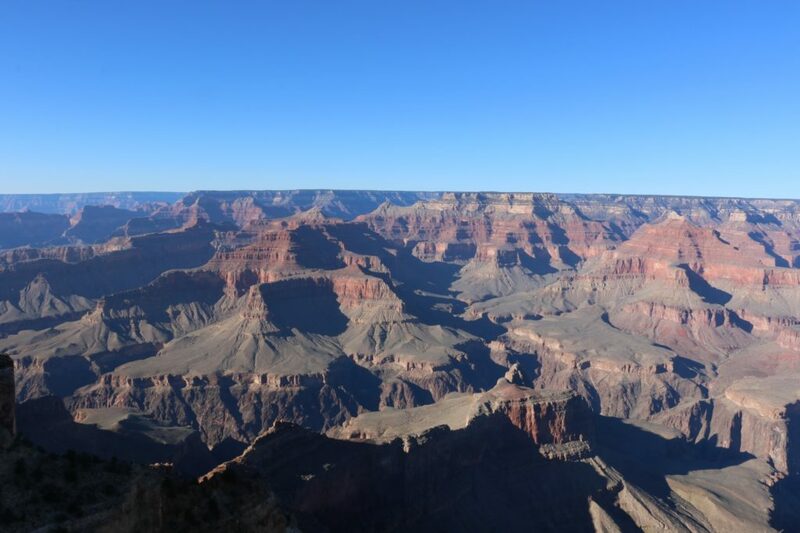 The most common place to visit is the South Rim of the Grand Canyon National Park. And this is where we ended up. November is considerably cooler than the Summer months, and although snow is always a risk, we were blessed with very mild conditions. The cold weather does ensure far fewer visitors to the park compared to the summer months. From LA it’s a pretty easy 8 hour drive to the Grand Canyon. There are different routes you can take, but not a lot to be seen if you’re trying to do a one day trip. Above you can see our full route for the trip. Green marks a place we overnighted, yellow marks a POI we stopped at and blue is the route we drove on a particular day. 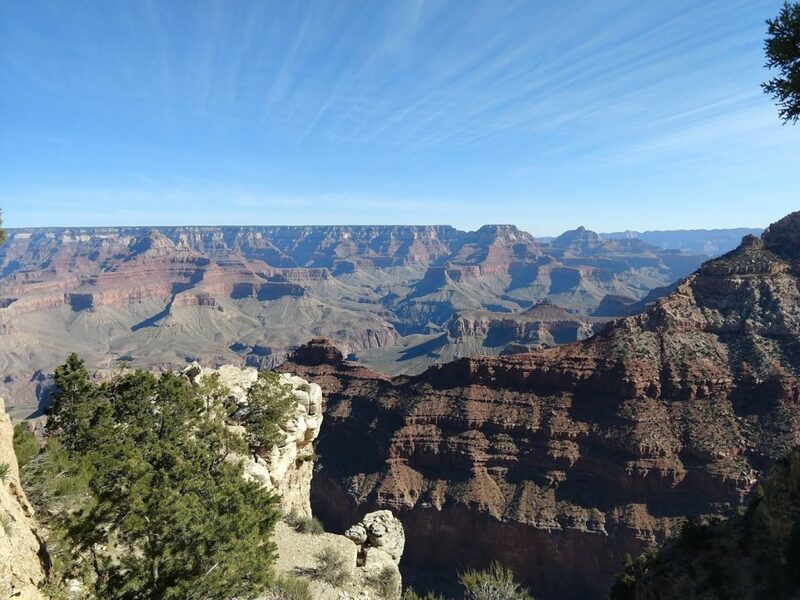 We spent two two full days exploring the Grand Canyon National Park (three nights), opting to stay at an AirBnB just out side the park instead of the variety of hotels within the Park. Camping is on the list for next time, but wasn’t feasible with overseas guests. Instead we got a spacious, woodfire heated cabin, miles away from anyone, all to ourselves. Two days is certainly not enough time to see everything in the park (and we were only looking at the South Rim), but we tried to see as much as we could. Day 1 we just spent getting our bearings. Hiking out to Yaki point in the East, returning via shuttle for lunch, and doing a combination of hiking and taking shuttles along the rim path to Pima Point in the West. Getting to take in all the splendour of the canyon, spending plenty of time stopping for photos. For day 2, we really wanted to get into the canyon a bit. 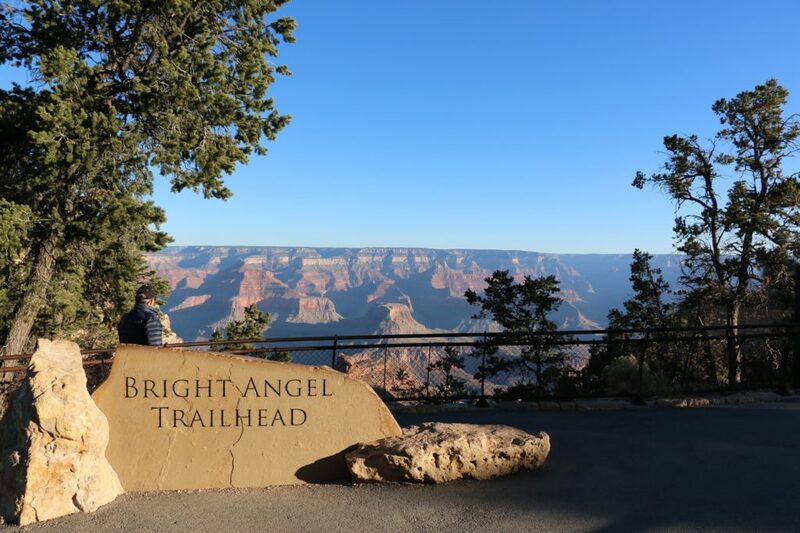 The easiest way to do this is the Bright Angel Trail. Starting in the Grand Canyon Village, the trail drops down past two rest stations and onto a small plateau. From there it carries on through the Indian Garden where it splits. 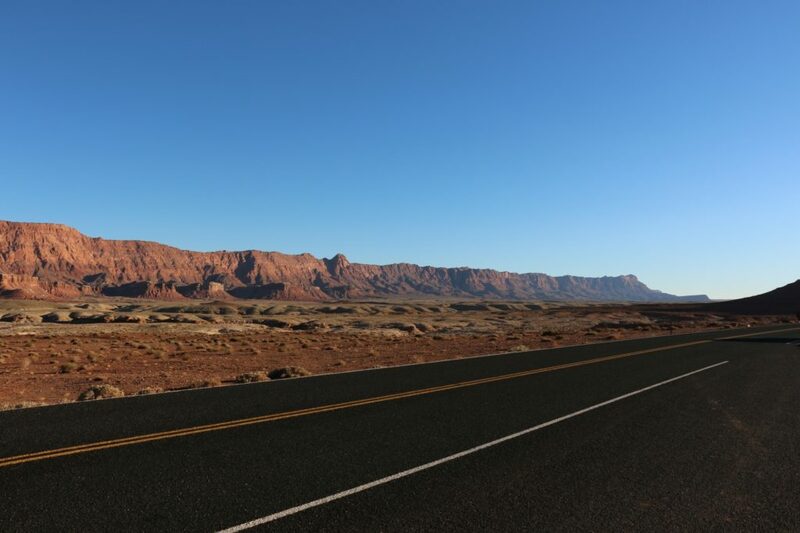 One route takes you further to Phantom Ranch (on the north side of the Colorado River), and the other to Plateau Point ( a viewpoint into the canyon). The National Parks Service (NPS) have to deal with hundreds of thousands of visitors coming to the park every year. All of them wanting to see the canyon. Many of them of questionable fitness. Unlike most hiking trails which make you do all the hard work first (climbing the mountain) and give you an easy route back, hiking into the canyon is the opposite of this. As the signs regularly warn you, “Down is Optional, Up is Mandatory”. Additionally many of these people arrive in the heat of summer. This has resulted in the NPS posting very conservative times for completion of hiking routes. We got down to the Indian Garden in pretty good time, but had no idea how long it would take us to get back. Taking the NPS posted times into consideration, as well as the short winter days, we opted to head back up instead of pushing on to the plateau viewpoint. In hindsight, we could have easily made it to the rim and back without trouble. The hike back up, although gaining considerable elevation, does so at a steady gradient. Meaning it only took us marginally longer to get out, than it did to get in. Oh well, now we know for next time. We did at least get a chance to stop by the Yavapai Museum of Geology, which offers spectacular views into the canyon, and good displays explaining how the canyon came to form. Well worth the visit. Our next stop was Page, Arizona. If you’re heading north, you should definitely take the time to drive the Desert Trail along the rim of the canyon out East, instead of just sticking to the main roads through Flagstaff. Beyond the additional viewpoints, you also get to stop at the Desert View Watchtower for even more spectacular views of the canyon and the Colorado River. 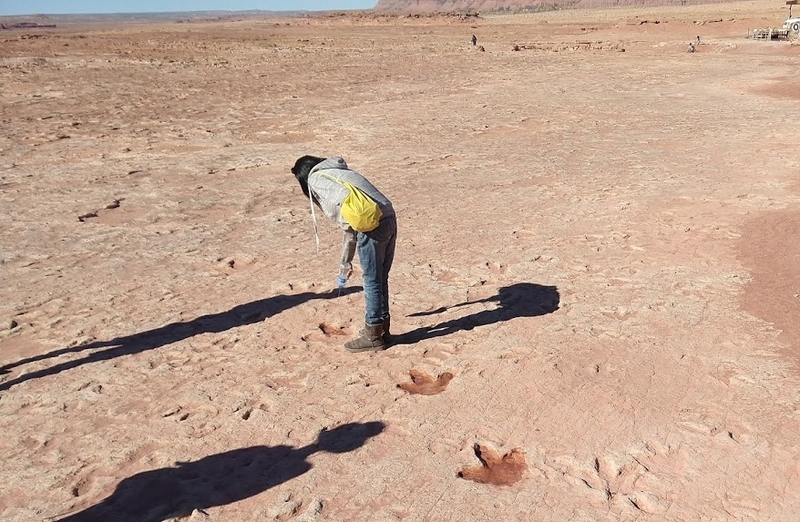 When travelling between Page and the Grand Canyon South Rim, you can also stop by Moenkopi Dinosaur Tracks. Sitting on a part of the Navajo Nation, this attraction is self-managed, and not part of a National Park. In my opinion this makes for a non-ideal situation. You’re given an amazing first hand experience of multiple dinosaur artifacts, including very clear dinosaur tracks, with the ability to even touch them. However, there is no thought of conservation. And no information is available, besides what a guide may be able to tell you. Entrance is free, but you will be approached by locals offering to guide you, also free of charge. You should take a tour, and tip your guide at the end. Less than half an hour, but amazing to see. You can read more about it here. Page is a small town that many people probably don’t know about. It started as a company town to house the people building the Glen Canyon Dam, that contains Lake Powell. Many residents now work for the nearby Navajo Power Station. Lake Powell is a popular tourist destination for boating enthusiasts, but Page is also well located as a center point between a multitude of National Parks. 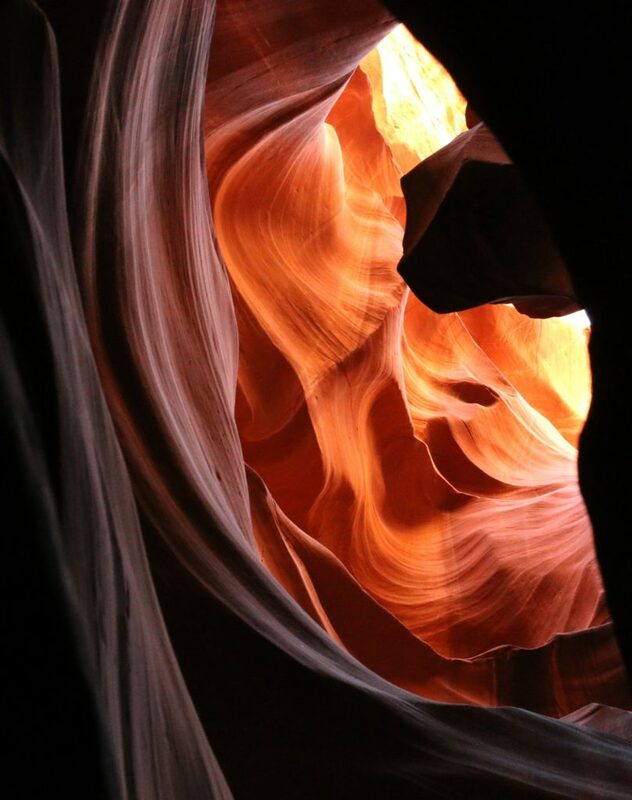 As for things to do in Page, it’s most notable tourist attraction must be the distinct Antelope and other slot Canyons. Amazing colours, with intricate lighting provides plenty a photo opportunity. 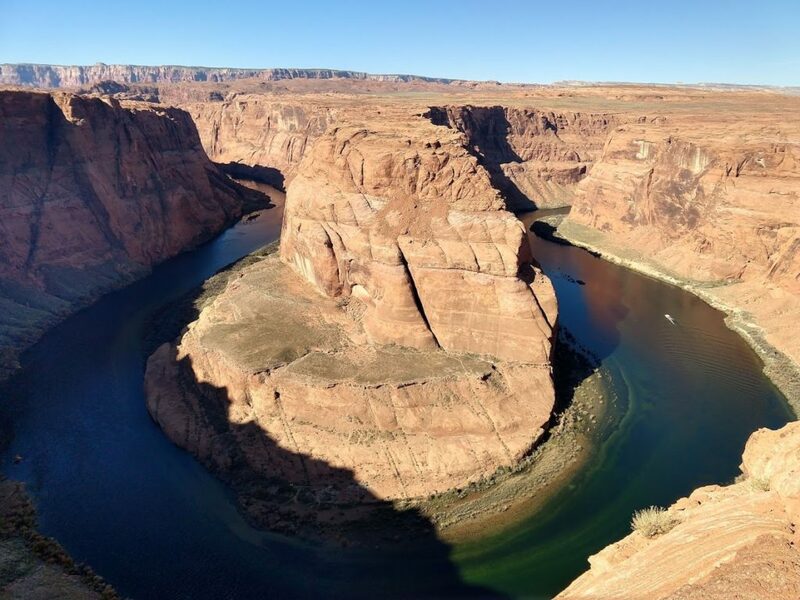 The well-known Horseshoe Bend is also only a few minutes drive out of town. We can also recommend a drive out to Lee’s Ferry. It has several great hikes, and access to the Colorado River. With only a week for our trip, we didn’t have time to see much else, but did make sure to drive through Zion National Park. Another location with stunning vistas, immense mountains and natural beauty. We fortunately were able to take the time to stop in the park for lunch and hop on a shuttle up into the deeper parts of the canyon. As with every stop we made on the trip, it was well worth it. 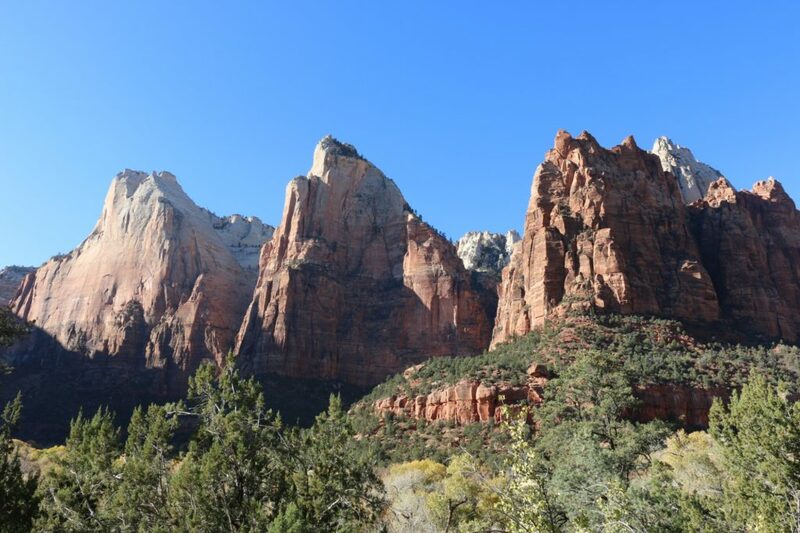 Zion is definitely staying on our list of places to visit, deserving more time to hike and explore. Our trip was scheduled to end in Ventura, visiting some family. To cut our last day in half we set our sites on Las Vegas. Picking a hotel just off the strip we were able get just some of the Vegas experience, without diving in completely. A walk down the strip, dinner and some fountains were a nice way to wind down. One week is by no means long as far as US roadtrips are concerned, but it gave us enough time see what we wanted to see without rushing. The trip added another 1,700 incident free miles to our car, getting it to cross the 90k mile mark somewhere between Vegas and Barstow. The rest of the year looks to be fairly quiet beyond some local camping, but next year we hope to limit the international travel and instead focus on seeing more of the US. Zion is already on the cards for April.